It was January 8, 2006 and the football had crested and was on its way down to a streaking Chris Henry who was a step ahead of the Steeler defender. I was in Section 337 at Paul Brown Stadium and as the rookie ran under the ball and made the catch, I and 65,000 of my closest friends went crazy. The Bengals had arrived and came out as the aggressors in their first home playoff game in fifteen years. It was going to be great. Of course, you probably know the rest of the story. Carson Palmer’s knee was blown out on the play, Henry was injured too, and the game went downhill not long after that. When the news of Henry’s accident surfaced last week, followed by his untimely passing the next morning this was the one play (video – first 30 seconds) I was stuck on. I have been a season ticket holder since the arrival of Marvin Lewis in 2003 and seen Henry play since his 2005 rookie campaign but this play went through my head all day Thursday, the day of Slim’s passing. There are two reasons why I think it left such an impression with me, the first of which is how it encompassed and paralleled the unfortunate legacy Chris Henry leaves behind which is that of unfulfilled potential. This has been written and discussed ad nauseam and was even pointed out by Coach Lewis last Thursday afternoon. The long pass to 15 that late January afternoon was about hope and promise as much as it was about “what could have been” after the play ended and damage was assessed. The other reason I think that play stuck with me is because it is a reminder of how quickly and dramatically life can change and how many of us find ourselves in positions we wouldn’t have expected just nearly four years earlier. I sat in Covington’s Riverside Park on Thursday evening looking across the river at PBS wondering this thought, and then recognized that had I been told back then that I’d be in Riverside Park on December 17, 2009 I would have undoubtedly called you a liar. There was a fire glowing alongside the Ohio River that evening in the shadow of Paul Brown Stadium, and I’m going to guess that if you told whoever was being warmed by it four years earlier that they would be homeless and living by the river they would have done the same. And assuredly had you told Chris Henry that he was to meet his untimely death he would have had more than a few doubts about your prediction. His passing to me was a reminder that to some degree we all have pieces of our lives that unfold that we don’t expect, or count on. Some are good, some are bad, and some just are. I do find it somewhat ironic that out of all the plans we make and how much control that many people like to have, life continues to unfold in unexpected and sometimes confounding ways. We live and work in a society that is about chasing dreams and making plans, but sometimes the best parts in life are the ones we don’t expect. The unexpectedness can also bring the worst parts in life which is what happened last week. Regardless of your feelings about Chris Henry and some of his past exploits, his passing is tragic and yet another moment in time where the circle of life is broken yet again as a 26 year young man was buried yesterday. Aside from seeing him around town a few times over the years and of course Sundays on the football field, I didn’t know him nor am I going to pretend to. But that doesn’t mean that I was unaffected. To me his passing was not just about a reminder of how fragile life is, it was so many life lessons that we all can easily forget or not even recognize until it’s too late. So long, Slim. We were rooting for you in so many ways, and now we root for those you left behind. 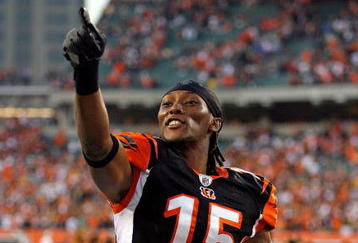 Chris Henry image from BleacherReport.com. Next articleFountain Square Ice Rink open on Christmas! !